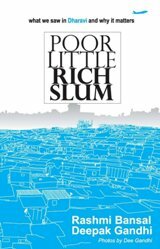 Poor Little Rich Slum by Rashmi Bansal and Deepak Gandhi offers us a peak into one of the world’s most famous slums – Dharavi. I’ve never been to Mumbai (so many years since it has been renamed and I still prefer calling it Bombay). It is the only metro in India that I haven’t visited yet but I have heard so much about it that it is high up on my wish list. I hope to explore it sometime in the future. However, I am quite sure that I probably wouldn’t be dropping into Dharavi. I really doubt if any Indian – except politicians, researchers, the religious, social workers or those who live & work in slums and those who avail of their services – would voluntarily step into a slum, unless forced to and especially not on a vacation. Somehow, Westerners seem to be enamoured by India’s slums. Call it an after effect of Slumdog Millionaire (a nice movie although why it won an Oscar is puzzling!) the spotlight seems to be suddenly shining on an entity which we Indians usually tend to ignore. Most of us are so used to seeing slums in our cities that we are pretty much oblivious to them. Mumbai’s famous slum has been covered a lot in recent times – but almost always by foreigners. Hence it is interesting to note that Poor Little Rich Slum has been created by Indians with a focus on the spirit on entrepreneurship in Dharavi. Also, I think that the book is written specifically for an Indian audience too - because there are a lot of quotes in Hindi for which no translation has been provided. The book has a coffee-table-book quality to it – although it is quite slim. It is made up of short, easy-to-read chapters, each talking about the bigger picture of Dharavi through the smaller stories of its inhabitants. The book is peppered with photographs – most quite fascinating while some, well, how do you capture filth and dirt beautifully? But the stories themselves and the enterprising people we meet during the course of the book are nothing short of inspiring. There are days when we, the privileged, seem to crib about the silliest of things in our lives; moaning that it is too hot to get any work done or that our neighbours were too noisy to let us sleep in peace. Therefore it is amazing to realize how much can be achieved with practically next to nothing – except courage, determination and perseverance. It is clear that the soul of Dharavi is its people. There is Jameel Shah - whose shoes are patronized by Bollywood biggies, Hanifabi and Salma – crusaders who are help women battle domestic violence, Panju Swamy – whose idli stall is Dharavi’s connection to South India, Faheem and Tauseef – the bright, young founders of Be The Local Tours & Travels and so many more resourceful people who have risen above the poverty, the uncertainty and the chaos that surround their lives; people who have not let their hopes and dreams to be overwhelmed by their circumstances. Perhaps because the negative aspects of Dharavi have already been well documented in mainstream media, this time the authors have tried to portray a different side of Dharavi by showcasing its positive points instead. Poor Little Rich Slum shows us that Dharavi is a lot of things to a lot of people; a place to call home, a workplace to earn a livelihood, a school of life, a novelty for tourists, a curiosity for outsiders and most importantly, a place that offers numerous opportunities for survival - but one which also pushes you to test your inner limits. Mumbai is for sure a colorful city, high rise buildings and glitterati on one side and the the poverty stricken folks just next door to them. Yeah I did come across Behind The Beautiful Forevers when it was reviewed at Women's Web. But as I write this I can't help but notice Shantaram staring at me from my bookshelf! I picked it up a couple of months ago and it is such a huge book that I've been postponing reading it. I guess Mumbai's slums play a big role in that one too; so I suppose I need to finish that one before moving on to Boo's book!